On the 15st of January 2018 the Award Ceremony for the 6th edition of the global Ethics & Trust in Finance took place in Paris, at the Conference Center of the Banque de France. The Ethics & Trust in Finance Prize – promotes throughout the world greater awareness among young people concerning the benefits of ethics in finance, and encourages high-quality management of banking, insurance and financial services based on trust and integrity. This competition invites young people, aged under 35 years, from throughout the world to write essays addressing issues in relation with ethics & trust in finance. On the 15th of January 2018, the Awards of the 6th Edition (2016/2017) have been distributed. 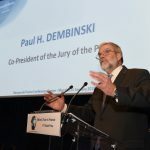 Paul H. Dembinski opened the Ceremony welcoming the laureates, the members of the Jury and the keynote speakers, http://www.ethicsinfinance.org/2016-2017/award-ceremony-of-the-6th-edition/introductory-speech-of-paul-dembinski/. 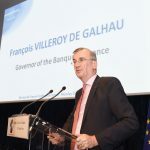 First keynote speaker, Mr. François Villeroy de Galhau, Governor of the Banque de France addressed the audience followed by Mr. Angel Gurría, OECD Secretary-General. The speech of the Governor is to be found here: in English or in French. The Governor stressed in his speech the complementarity of stricter rules AND ethical behaviors, and showed that any attempt to present them as an alternative is deemed to fail. The Secretary General of the OEDC, congratulated the laureates and stressed the topicality and urgency of their work. 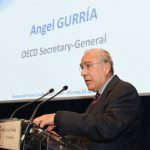 He also underlined the complementarity of the efforts of the Prize and those of the OECD which, in the last ten years, has addressed issues such as governance, corruption, tax and profit shifting, transparency and culture of financial institutions. Despite all this, much remains to be done said the Secretary General as he invited young generation to work relentlessly to make the economy and finance better serve society and the human person. Financial activity is far from static – fintech, and regtech – are changing the landscape of finance. Reviving ethics in the sector, is thus much more than a catch-up process. While catching-up, we have also to prepare for the ethical challenges related to technology and changing regulators environment – This is a real challenge. For a long time, I have been involved with professional bodies in Scotland, UK and European Union. These bodies have to play a role in strengthening the sense of ethical concerns among future employees, before they enter the “financial industry”. We have developed teachings cases and standards in these fields. The “ethical oath” introduced in the Netherlands might also be a symbolic step to be envisaged in other countries. Professional bodies have the ability to discipline and also to sanction the inadequate behaviors. This should not be ignored. In this sense professionalization of financial activities empowers also the employees in the field of ethics. When discussing ethics, one should not forget the context. Ethics as one element of a wider financial and economic system which generates its own constraints and incentive structures which sometimes – not to say often – run against ethical concerns. If the tension is too strong – as it is the case since in the rush for short term results – ethics may remain forever only a “good intention. In consequence, there is a systemic dimension to the reinforcement of the role of ethics. The tension has to be reduced by regulations and institutional changes to pave the way. The 6th edition 2016-2017 attracted more than 200 expressions of interest and more than high quality 70 papers. In the final phase of its work the Jury (http://www.ethicsinfinance.org/about-us/the-jury/) composed of 20 world class personalities, worked on a short list of 11 papers, and allocated the 20 000 USD to authors of the following four essays. To know better the winners watch their interviews. The 11 nominated essays have been published in a special issue of Finance & the Common Good / Bien Commun review of the Observatoire de la Finance. Download the press release and the full program.